Shwedagon Pagoda at sunset, Yangon, Myanmar. Asia is the largest continent in the world in both, area and population, the continent is situated almost entirely north of the equator except for some Southeast Asian islands. Asia is connected to Africa by the Isthmus of Suez and borders Europe (part of the same landmass) along the Ural Mountains and across the Caspian Sea. Area: about 49.7 million km² (19,189,277 sq mi) it covers about 30 percent of Earth's total land area. The area is shared by 48 countries, by far the largest country by area is Russia with more than 17 million km², second is China with 9.6 million km², smallest independent state in Asia are the Maldives with 298 km². Population: more than 4 billion human inhabitants (4.4 billion in 2016), about 60 percent of the world's population. 1,4 billion of those people live in China (in 2015). Seven out of ten of the most populated countries are in Asia. Highest Point: Sagarmatha (Chomolungma; known as Mount Everest) 8,848m (29,028 ft) Nepal. Ozero Baykal, Lake Baikal 31,500 km² in Siberia is the world's largest freshwater lake by volume. Longest River: Yangtze (Yángzî Jiang, or Chang Jiang (simplified Chinese: 长江) China, 6,380 km (3,964 mi). Languages of Asia: Arabic, Chinese, Hindi, Japanese, Korean, Malay, Russian, Thai, Turkic, Vietnamese and other. Maps and information about all capitals in Asia. Political Map of Central Asia and the Caucasus region. Political Map of South East Asia. Map of Southwestern Asia and the Middle East region. keywords: countries of asia, countries of the eastern hemisphere, travel asia, destination asia, population of asia, capitals of asia, central asia, eastern asia, south-central asia, north asia, south-eastern asia, western asia. 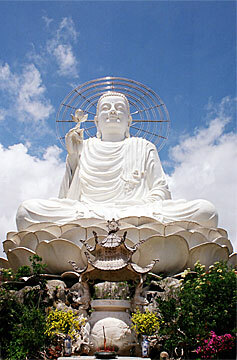 Great Buddha Statue near the city of Dalat, central Vietnam. ASEAN, an international organization of South East Asian nations, founded on 8 August 1967. The Secretariat of ASEAN is located in South Jakarta, Indonesia.